As we move on from the third book in the series, in which Wheatley introduced us to one leading figure of Occult history with Crowley’s Moonchild, we move to another leading figure in that world for the fourth book, Helena Petrovna Blavatsky. 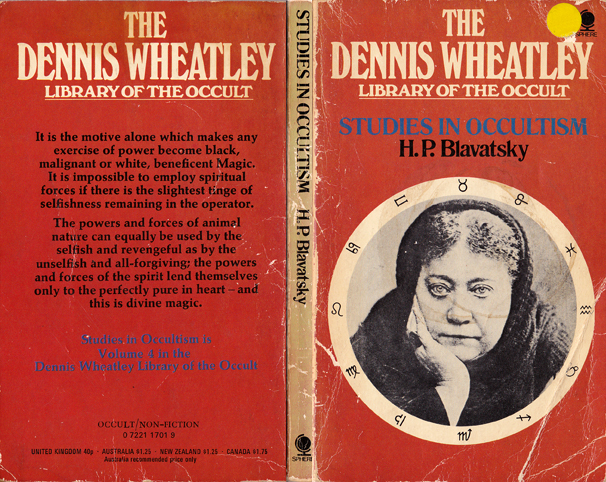 It seems from his introduction that Wheatley really wanted to include Blavatsky’s major work, Isis Unveiled, into his Library of the Occult series but as the series was a new venture it was deemed impractical to include such a massive two volume edition at this point; although, as Wheatley states, he did want to find a way to include it, along with other longer editions, at a later date. Sadly his Library of the Occult series ended earlier than anticipated at a total of 45 editions so this never happened. What we have instead is Studies in Occultism; a collection of Blavatsky’s articles taken from her Theosophical magazine ‘Lucifer’. As we all know, Blavatsky was born in 1831 to an aristocratic Russian family. From a young age she travelled widely, both in the East and West, and supposedly learnt about mysticism from various personages along the way. This led her to co-founding the Theosophical Society in New York in 1875. Her particular brand of pick and mix mysticism laid the foundations for much of the occult traditions of the 20th century leading to what popular thought now broadly categorises as the “New Age”. The series of articles published in this volume are from a Blavatsky approaching the end of her life and there seems to be a bitterness underlying all of them. Let’s not forget that Blavatsky was very much a product of the 19th Century. With the rise of materialism and the glorification of the physical sciences during that period there were many, as is natural, who discarded these new-fangled ideas and returned to earlier beliefs; in the arts we saw the Romantics, the Pre-Raphaelites, the Gothic Revival and the Arts and Crafts Movement. People rejected the modern and resorted to Medievalism; and Blavatsky was no different. In these articles Blavatsky calls out pretty much everyone who doesn’t follow her creed as Black Magicians, especially those within the scientific community. Perhaps she was tired of all of her detractors, she had been deemed as a fraud and a plagiarist many times, and these articles were a last ditch attempt at her defense of Theosophy. But the most interesting thing about this book, for a collector such as myself, is not something the author intended, nor the publisher and not even Wheatley himself. Most collectors favour volumes in as pristine a condition as possible. Perfect little packages which look as though they’ve just come fresh from the printers, unread. For myself, I say, bring me your ragged, dog-eared editions. The books that have lived. The books that have been loved. The ones that have suffered from being stuffed into back-pockets or rucksacks to be read on journeys. I love the ones that have been scrawled in, where previous readers have been so impassioned that they’ve highlighted sections or added their own footnotes. 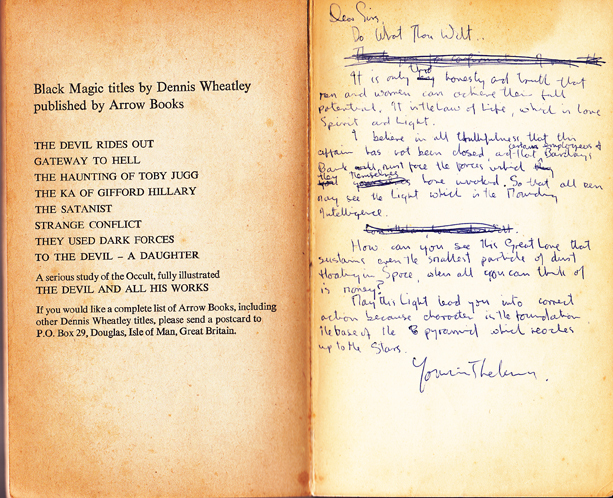 Books that have been claimed by the owner writing their name on the flyleaf. Phone numbers written on the cover when that was the only paper they had on them at the time of a chance liaison. The makeshift bookmarks found in them, train tickets, theatre tickets, shopping lists, photographs! Even the marginal doodles. This edition holds possibly my favourite reader addendum in my collection. It’s a perfect accompaniment to the volume; on the inside of the back cover we have a draft of a letter from a disgruntled Thelemite to his or her bank. Isn’t this just wonderful? I’ve included a typed version beneath for ease of reading. Do What Thou Wilt . . It is only by thro honesty and truth that men and women can achieve their full potential. It is the Law of Life, which is Love, Spirit and Light. I believe in all truthfulness that this affair has not been closed and that certain employees of Barclays Bank will must face the forces in which they you yourselves they themselves have invoked. So that all men may see the Light which is the (???) Intelligence. How can you see this Great Love that sustains even the smallest particle of dust floating in Space when all you can think of is money? May this Light lead you into correct action because character is the foundation, the base of the pyramid which reaches up to the stars. Hahaha, The letter to the bank is fantastic. I love finding stuff like that! John, I am working on a piece that borrows a piece of your photograph, this line: “So that all men may see the Light which is the (???) Intelligence.” I posted the piece on Facebook, so that you could see what I did. I hope it’s okay with you. Of course, Lin. More than happy. Delighted, in fact!